Hi! Brandy is in Virginia and having very sketchy internet access so y'all get me! Try to contain your enthusiasm. You'll make Brandy feel bad. My topic today? YA. Young Adult. The genre not the people. I recently read an article that talked about the growing popularity of this genre and how publishers will be offering more contracts as well as larger advances to authors of this genre. My first thought? Crap with a capitol C! I don't write YA. Come to think of it, I've never even read YA. SIS Beth advised me not to be discouraged. There are always trends. Always. Just keep writing. That's the important thing. She also suggested that I read a YA. She said I'd be surprised. A quick peruse of my personal library and I had one in hand. I remember purchasing it at my local bookstore just last month. Why? I'm only slightly embarrassed to admit it was primarily because of the cover. One of the best looking and best feeling covers I have ever come across. You have to see it and feel it to completely understand. Another reason I bought it was because someone at the bookstore had written a note stating it was better than Twilight. Really? Wow. I say this without ever having read Twilight but I know what a huge phenomenon it is. HUGE. I blogged about this book at Loud Whispers but I had only just begun to read it. I'm now on page 483 and can I say...Oh my goodness? This book is fantastic. 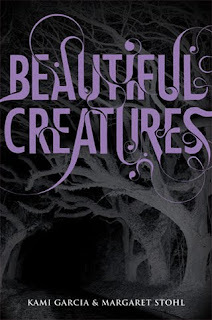 Beautiful Creatures is the debut book of Kami Garcia and Margaret Stohl. Debut? Are you kidding me? This story is so well written I can't stand it. Their description of the southern scenery, the small town people and the not so small town "people" is something I hope to learn from. Amazing. Simply amazing. I started off having doubts. First of all it's written in first person through a 16 year old boy. Really? Yep and let me tell you, I quickly learned to love first person through that 16 year old boy. Second of all, the romance is between this 16 year old mortal boy and a 15 year old "Caster" girl. I got over this as well. Ethan and Lena will stay with me for a very, very long time. I guess my point it this: I shouldn't knock it 'til I try it and if this is YA, I definitely say YAY. How about you? YA? Yay or Nay? A definite yay. I've been reading them for some time and have two YA books in the works. I also read an ARC of Beautiful Creatures a few months ago when copies were sent to my local bookstore. I belong to the YA readers group there. And thought it was fantastic. I've also picked up a lot of new YA authors that are great. It's actually fun to write the teenage mind. Hi, Barb! Happy New Year! First, I have a love/hate relationship with ANY type of pigeonholing (e.g., "YA") -- being a musician for the better part of my life (an art which deals with this mindset regularly), I have found it not only limits the arts (though you had the wisdom to step outside your "normal" read and find a great book, MOST people do not), but also pressures the artist (can you hear the writer who could be the next great novelist across the way saying, "Gee, I know squat about 'YA,' but if that's what they want...," followed by the sound of their true calling dying a lonely death?). The upside - the Gen. Public likes to follow, so some GOOD art is being appreciated simply because it now happens to be the "trend." Yes, I know it's a business, but writing to follow a trend/buck just doesn't work for me. Seems if it continues, we'll be left with more 25 cent paperbacks in that big bin/albums with the hole drilled through the case in the bin next to it/paintings that are bought in bulk by Motel 6 and fewer "Oliver Twists," "Songs In The Key of Lifes" and "Starry, Starry Nights." So much for my rant (haven't you missed me? -- LOL!). Otherwise, listen to your SIS Beth, JUST WRITE! Writings from your heart, mind and soul will either become famous, a trend, or whatever --- or NOT. If you could predict success, would you even bother? Be happy for the fellow artist who STARTED a trend -- and, if you ever get the chance, ask if that was their intent (obvious answer shall ensue). As I said, you made a great positive step -- you read something outside your norm (can I tell you how much I hate people that say, "I HATE music/books/movies"? As if all in any said genre are the same quality) -- that ALONE will make YOU a better writer. There is NO such thing as TOO much information for an artist! YAY for YA!! Now, write what you know and FEEL, and hope for the best ... as we all do! Definitely yay! :) Heck, I still like to read the mysteries I used to read when I was a kid. There's a fun YA fantasy series that I've gotten hooked on by Michael Scott. The first book is The Alchemyst. So far, that's the only one I've read but I have the second book in my TBR pile now. Working in the library as I do, I'm constantly aware of YAs. I haven't read one cover to cover, but I do read blurbs and skim first chapters. Several surprised me in how 'adult' they were. I was told that kids typically like to read about characters two years older than they are. So for instance a 14-yr-old girl enjoys stories featuring a 16-yr-old heroine/hero. A 16-yr-old enjoys reading about an 18-yr-old. Makes sense if you think about it. Anyhoo, a couple of days ago I started reading INKHEART. It's actually classified as a 'juvenile' (age class below YA) book, but then again so is the Harry Potter series. At least in our library. I'm only a little ways into INKHEART but I am loving it. After reading your rec on BEAUTIFUL CREATURES it's definitely going on my TBR list! Definitely encouraging to know that authors do write in more than one genre. To me it means the possibilities are endless. Quick question...Will your YA's be written under the name Linda Wisdom? It's pretty much what our mama's always told us..."You don't know if you like spinach because you've never tried it." And to add to that, spinach can be cooked or not cooked in a variety of ways. What I'm trying to say is I agree with you completely. I had a feeling you would be a "Yay". Your reading choices are so across the board it amazes me. I always find it a treat to hear what you're reading at any given time. I hear INKHEART is fantastic. I think I'll add it to my list. Knowing now how "adult" YA books can be, I think I'll have to pay very close attention to what my daughter is reading. And yes, most of the adults I know have read Twilight and Harry Potter. Looks like I'm the odd man out. Yes, I'll use the same name. Others have. An editor's interested in my two projects, so let's hope! That's wonderful, Linda. How exciting! A new venture!!!! The Witch Is In The House!